Reach out to our San Francisco-based alumni coordinators, Kirsty Traill and Gia Punjabi, or follow the University of Auckland San Francisco Alumni group on social media. Keep up-to-date on the latest alumni events and networking opportunities by joining the University of Auckland San Francisco Alumni group. Gia graduated from the University in 2014 with a conjoint Bachelor of Commerce and Bachelor of Science. 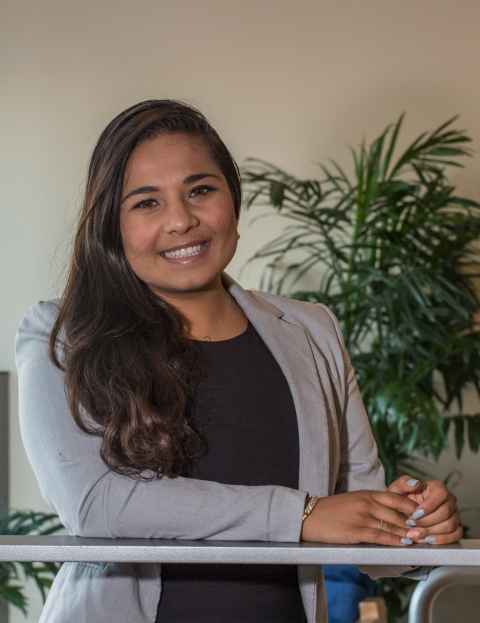 She launched her career as a Graduate Analyst at BNZ, working on the financial markets trading floor. Less than two years later, she got the opportunity to move to California. Gia now lives in San Francisco, where she works as a Financial Consultant with Corporate Finance Group International. commercial pilot-glider license after discovering a love of heights at sixteen. Gia is keen to hear from alumni based in San Francisco. Kirsty left New Zealand 11 years ago and moved to Tokyo with Hewlett-Packard (HP) for three years. From there, HP moved her to their headquarters in California, and she subsequently joined a subsidiary start-up in San Francisco. Now, she works for the world’s most widely used social media relationship platform, Hootsuite, as Vice President of Customer Support. In her role, Kirsty is responsible for a global team of customer advocates in four locations, delivering world-class customer support, as well as using customer insight to drive strategic initiatives and deliver a superior customer experience. Kirsty says that you never know where you may end up after you graduate. “If you had told me that I would be living in San Francisco working in social media when I graduated, I would have been highly sceptical." Her best memory of her student days in Auckland is studying in the sunshine in Albert Park in summer. Kirsty’s advice to students is to, “find your purpose, follow your passion and dream big." Outside of her busy working life, Kirsty is a certified yoga instructor and enjoys both practising and teaching a vinyasa flow style of yoga. She also enjoys snowboarding, hiking, and scuba diving. One day she hopes to travel to Machu Picchu and hike the Inca trail with her closest friends. Kirsty is interested in hearing from alumni based in San Francisco.